As a nonprofit public benefit educational institution, the Western Railway Museum relies on charitable contributions to preserve, restore, and operate our collection of authentic, historic electric railway artifacts. Donations also support our educational programs that serve 1000 students and educators each year, as well as buy materials needed to conserve, catalogue, and manage the tens-of-thousands of historic photographs, documents, books, maps, and histories in the F.M. Smith Memorial Library and Archives. Deferred facilities maintenance and repairs to existing buildings (some over 50 years old!). Employing professional staff to promote the Museum, conduct educational programs for schools, and develop new public activities. 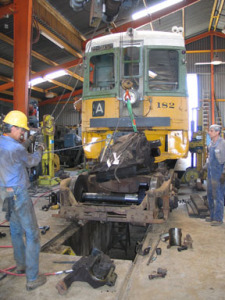 Expand our maintenance and restoration shop facilities so that our volunteers can be safer and more productive while working on our historic train equipment.